One of many awesome cosplayers at MSP ComiCon who stopped to give TCG some love with a photo op. A little over a week ago, I had the pleasure of being a part of MSP ComiCon, a local comic convention that has been held in high regard by creators and vendors within the local geek community. I was helping staff a table with Twin Cities Geek, which allowed me to enter the con with exhibitor status. 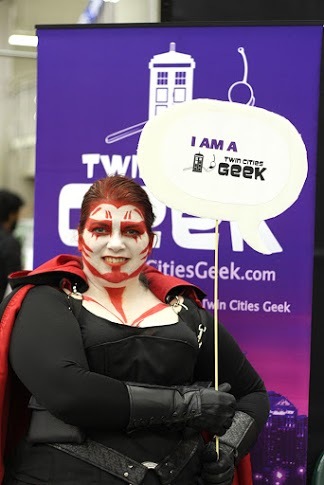 The convention graciously allotted space and resources for Twin Cities Geek to table at the convention, making the convention accessible to smaller organizations that might not be able to pay as much for attendance. Upon first sight, MSP ComiCon appears to be a small and fairly simple convention, but it is a favorite among artists and other exhibitors because of how well guests are treated here. In addition to not charging us for our table space, the convention treated each exhibitor to food and drinks in an upstairs seating area, completely free. I was also told that at the end of the night, everyone was treated to a steak dinner. What MSP ComiCon lacks in plush venues and celebrity appearances it makes up for in friendly charm, amazing swag (check out the cool Black Canary poster I picked up from the swag table at the bottom of this article! ), and sincere appreciation and love for the geek community and creators within it. What makes this convention so different from a lot of others is the sheer variety of contributors. There were writers, media organizations like us, a span of comics ranging from Dungeons & Drag Queens to a children’s book about Asian folklore, and more. Many of the folks I spoke with also said that this convention had much more artist engagement than others. Artists were front and center, receiving substantial attention from attendees, and most con-goers were seen walking around the convention with stunning, one-of-a-kind art productions they’d purchased there. Some of the tables and crowd at the convention. Walking around toting artistic treasures, there were also many families—and, notably, cosplaying families, including wee babies donning cosplays such as a toddler Scarlet Witch and a young Steven Universe. We even met the Real Captain America, complete with shield and young baby in tow, and I had the pleasure of meeting the lovely Hagrid and his handcrafted Monster Book of Monsters. I was particularly amazed at how friendly everyone was. Nearly everyone I and my fellow table staff approached wanted to have a conversation, share a story, or pose for a picture. As a first-time attendee at this con, I was surprised at the sheer variety of exhibitors present and pleased to feel so welcomed. MSP ComiCon is definitely a great event for anyone who loves comics and geekery and wants to dip their toes into the world of conventions. Pro tip: bring cash! This is much more of an expo convention than a party convention, and I guarantee if you don’t bring some spending cash, you will sorely regret it. There is a myriad of beautiful artwork, and more comics than the geekiest of us could imagine. Hagrid stopped by our booth with his Monster Book of Monsters. In addition to this yearly spring convention, the Midwest Comic Book Association also holds a smaller fall ComiCon, which this year is October 8. For more information, check out the MCBA at MCBAComiCons.com or follow them on Facebook or on Twitter. The sweet Black Canary poster I picked up at the swag table.